Who’s buying Netflix this week? It’s an odd game I’ve started playing while I’m researching trading opportunities to share with you. Everyone from Apple to Comcast to Walt Disney has, at one point, been a rumored suitor for Netflix. My weekly routine now begins on Monday morning by checking the financial media headlines to see who’s “buying” now. The best part about these rumors is that they have sound logic behind them. All of the companies mentioned above could benefit greatly from adding Netflix’s user base and content lineup to their portfolios. What’s more, all three have a wealth of cash reserves that make such a buyout realistically feasible. Of course, this is putting aside the fact that Netflix has given no indication that it wants or needs to be acquired. It’s doing fine all on its own. Meanwhile, Apple, Comcast and Walt Disney could really use Netflix’s help to solidify their position in the online streaming market. After all, Netflix is the online streaming market right now. This week, the “who’s buying Netflix?” game took an odd twist. 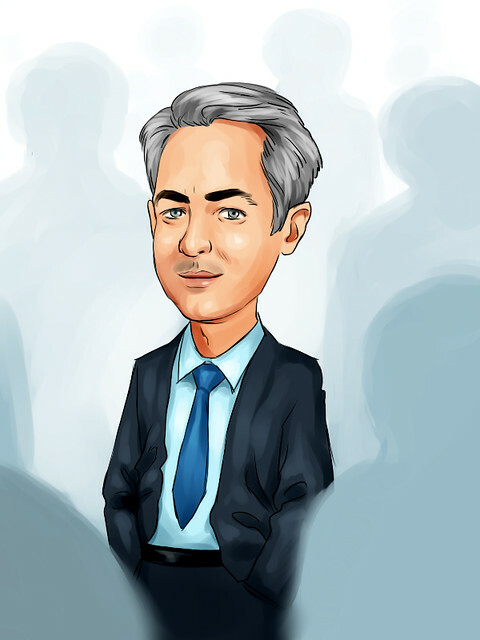 Mediatech Capital Partners analyst Porter Bibb said he believes that Microsoft Corp. (Nasdaq: MSFT) will buy Netflix in the next 18 to 24 months. It’s not that Microsoft doesn’t have the cash to outright buy Netflix. The company has billions stashed away. It’s not that Microsoft wouldn’t benefit from suddenly becoming the leader in online streaming. It’s that Microsoft doesn’t need Netflix. Like the online streaming giant, Microsoft is doing just fine on its own. So today, I’m going to highlight some reasons why you should be holding Microsoft in your portfolio — with or without Netflix. We’re at an odd point in the technology market. Startups aren’t attracting the same kind of exuberant market sentiment that they once did. This is a good thing for market sentiment and stock valuations. But it has also forced many investors to consider legacy technology companies like Intel and Microsoft. That’s not to say that Microsoft continues to ride the laurels of its Windows operating system or its tried-and-true Office software package. At least not in the traditional sense. Like many other software giants of the ‘80s and ‘90s, Microsoft has taken to the cloud … and it is once again finding market dominance. Currently, Amazon accounts for about 33% of the global cloud computing market. However, during the past 12 months, Microsoft has seen its market share in cloud computing rise from 3% to 13% — growth that far outpaces rivals Amazon and Google. Microsoft’s Intelligent Cloud unit comprises both its Azure cloud infrastructure and Office 365 suite. Office currently has about 120 million users, while Azure is adding some 120,000 users per month. In total, Microsoft’s commercial cloud unit revenue growth is 56% year-over-year in the most recent quarter. And that figure is set to rise. Currently, more than 90% of Fortune 500 companies are using Azure. With corporations looking to consolidate and reduce cloud computing costs, Microsoft stands to benefit. Furthermore, the company is innovating at a considerable pace. Last year, Microsoft released 130 new cloud services. This year, the company has about 70 more services planned for release. This combination of innovation and market consolidation is sure to benefit Microsoft’s bottom line, and lift MSFT shares prices. Despite its impressive growth, Microsoft’s price-to-earnings ratio of 66.2 is only slightly above the industry average of 60.9. Furthermore, dividend yield comes in at 1.7%, also above the industry average. In other words, MSFT stock still has room to grow considerably. 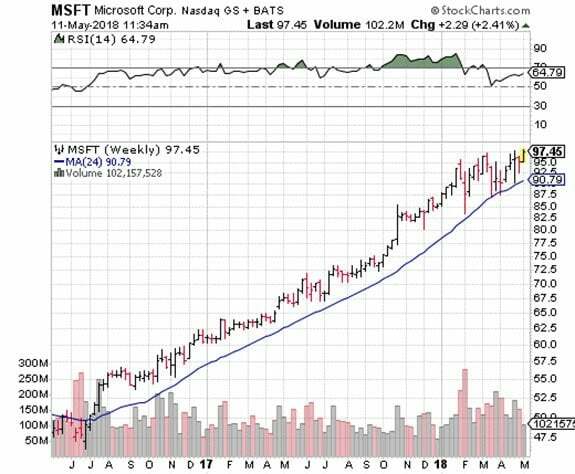 Technically speaking, MSFT’s price action has been strong and consistent. The shares continue to rally along support at their 24-week moving average, which currently rests in the $90 region. Any pullbacks to this trend line should be seen as buying opportunities. Ideally, you’d want to buy MSFT stock in the $90 to $95 range. As such, a put sell strategy targeted at the $95 or $92.50 strike could bring in some cash from options premiums and allow you to pick up the shares on any pullback. But bargain hunting in this market could backfire, and a rally north of $100 would put MSFT stock out of reach of this strategy. If you’re willing to take the risk and deal with short-term volatility, MSFT stock is a buying opportunity right now.